New Year's is certainly the biggest holiday of the year all around the world. Cities of every nation come together to celebrate the first day of the new year. During this holiday of joy and happiness, it is essential to be in the company of people you love. 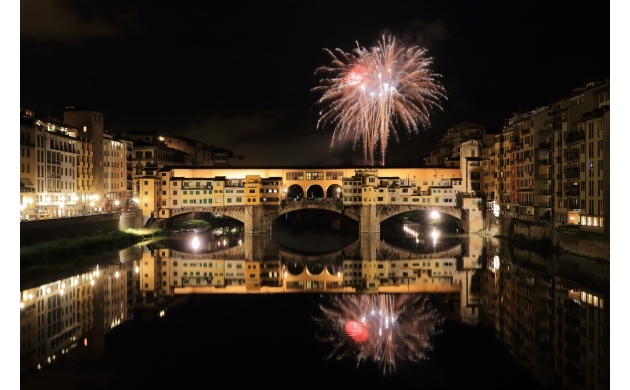 Florence offers many opportunities from which to choose, but there are certain traditions that are unique to Italy - and which can guarantee good luck and wealth for the new year. During the night of Saint Sylvester (New Year's Eve in Italian) there are 3 traditions that one needs to follow to ensure a good 2016. 1) For dinner it is obligatory to eat lentils (together with 'cotechino' and 'zampone,' two traditional meat dishes). This will bring good luck, but above all richness and money. 2) Wearing red underwear also brings good luck, but beware: the underwear must be a gift from someone who loves you and has to be thrown away the next day. So if you've got your red underwear and beans you're pretty much ready for New Year's! Now you just need to decide what to do. Go out to the city's fantastic piazzas or stay indoors in one of the many bars and theaters? Regardless of what you choose, there will be music to accompany you! Florentines love to spend New Year's out in the city's squares. There are 6 squares which are particularly famous, but only the last one may give you some real surprises. Piazza Pitti in the center of Florence, will undoubtedly have the biggest party in the city located under the Loggia of the Lanzi. Irene Grandi and Alessandro Mannarino will sing for the new year's eve. Piazza San Lorenzo will host Sarah Jane Morris and the Tentet Swing of Nico Gori. Piazza Signoria on the other hand will be dedicated to the viennese waltz of Chernivtsi Orchestra. Piazza Santissima Annunziata will have on stage the One Voice Gospel singers and the Cleveland Gospel singers. Piazza della Resistenza in Scandicci will host Forrò Mior, Modena City Ramblers for a night of folk rhythms. Piazza Santo Spirito is probably the most typical Florentine square. It will host a concert of street music where you will find yourself just steps from the Ponte Vecchio. It is quite difficult to move around Florence on New Year's. The center of the city will be closed to vehicle traffic for the entire night and it will only be possible to get around by bus or tram. In reality, it will be very hard to move around town: even if you rely on taxis. If you want a suggestion, try to spend the holiday around your apartment. Amidst the joyous celebrations, it's going to be tough to move from one spot in the city to another. Happy New Year's Eve and Happy 2016!